To remedy this, the R50 features full text editing under the “Advanced Setup” menu and “Edit Labels” option. Utilizing a system similar to the MX-500, the numeric keypad is used to enter letters just like texting on a cell phone. Available characters include upper and lowercase letters, numbers, plus 9 ASCII symbols such as brackets, period, ampersand and the number sign. No other symbols are offered, such as transport icons or arrows. Conveniently the screen is used to display a graphical guide of which key inputs what characters. The second line of text can only be accessed once the first line is full, which can be forced by padding the end with spaces... although the proportional font used by the R50 can result in uneven text centering even when the second line is similarly padded. [Left] and [Right] arrows can be used to select the cursor position, and although the default behavior is to insert new characters there’s peculiarly no way to add a space between existing letters. The graphical look and overall color palette of the R50 is completely preset: there’s essentially one button color, blue, and absolutely no background images (despite the example printed on the vinyl screen protector). This may seem limiting, but removing the hassle of working with graphics is crucial to keeping the R50 nearly as simple to configure as the text-based MX-500 – and it does end up looking a whole lot better. Macros – put basically they’re a string of commands stored on a single button. But what they really do is take a disassociated jumble of devices and turn them into a harmonious system that can practically run itself. With components supporting the right discrete codes, you can get one-touch control over powering your system on and off, switching your TV and receiver between different sources, and even full automation over common activities such as watching a DVD movie. 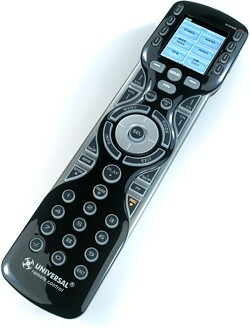 The R50 offers the most complete macro abilities of any of URC’s consumer remotes, with a macro of up to 255 steps in length assignable to any button. That includes all LCD-based soft keys, the [On] and [Off] hard buttons, as well as assigned directly to a device for automatic power and input switching. Combined that’s 1585 possible macros... talk about automation freedom! Recording a macro is a simple process: enter Macro mode from the Advanced menu, select a device and then a button for the macro. The top status bar will start flashing “REC”, with a step counter shown on the bottom. Navigate the remote and pick commands from any of the remote’s 18 devices. Changing devices doesn’t even count as a step, so that 255 step limit will go a long way. Pauses can be added by pressing the [Pause] hard button, with each push adding one-half second delay. Remember that once recorded macros cannot be edited – URC did think of such a feature, but it’s only available on the professional-level MX-450. Any macro that begins with a delay will only be sent if its key is held for the length of that delay. This is a great trick for automatic device selection macros when you sometimes like to be able to access a device, without changing the inputs on your system. Push and hold macros can further be combined with a preprogrammed or learned command for a dual purpose key, where the single command is sent if the key is pressed briefly and then the full macro only when held. While device macros on the Main Menu will always lead to their intended device, macros stored on other keys can be made to jump to any other device. Simply save the macro on the device you would like it to jump to when finished.